I always call my bees "my girls." If you know much about bee hives, you will know that the workers (girls) do all of the work (collecting nectar and pollen, cleaning the hive, raising the brood), the queen lays the eggs (I call the queen "mom"), and the drones (boys) are basically around to eat honey and mate with new queens. So, the girls are the ones that I connect with because I respect their hard work and dedication to their families- and I think they are super cute :) I keep bees at Temple University Ambler, where I work in the Arboretum. My co-beekeepers are Kathryn, professional horticulturist at Temple, and a few students, Kristen, Jenn, and Cindy. Our friend, Vince, has mentored us about beekeeping for the past two years. Kathryn and I also took a beginners beekeeping course from the Montgomery County Beekeepers Association. For those of you who know me, you will know that it makes absolutely no sense that I'm a beekeeper. I have spent most of my life running away from all things that sting and fly- a combination that I found terrifying. So, I think that my love of honey and wax products has miraculously overcome my fears of bees. The more I learn about bees, the more I want to know and the more I respect them. I guess the best way to overcome a fear is to learn as much as you can about it! Of course, my heart still pounds a little when I spend too long inspecting a hive and the girls start to get feisty, but I see that as my fault, not theirs. Earlier this summer, we combined two weak hives and hoped that a new queen would hatch from a queen cell and lead the troops. We added a few frames of undrawn foundation and not much was going on (they weren't building wax comb and the queen wasn't laying many eggs).When we were inspecting the hives this week, we decided to look underneath the screen bottom board (the very bottom of the hive) and we found that the girls were busy building comb underneath the hive! The comb was full of bees and eggs (so that means that the queen had definitely been down there). The girls never cease to amaze me. No matter how carefully you try to guide their actions, they will do whatever they think is right for the family. We had no idea what to do about this and just as I was picking up my cell phone, Vince, our knight in shining armor, pulled up to check on us. 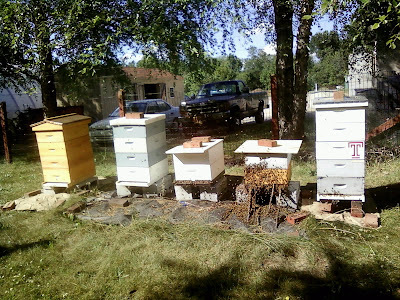 He immediately started disassembling the rogue comb and letting the bees climb back into their "proper" boxes. We still don't know why the girls did this, but you can't blame them for thinking outside of the box... lame joke, I know, but it is better than the slew of "bee" jokes that beekeepers throw around. What a wonderful blog. I enjoy your positive outlook on life. I wonder if your queen was clipped? I clip one wing on all of my queens. Then if the hive tries to swarm, the queen will not fly far and often she will drop to the ground near the hive. Once the bees realize that the queen did not come with them, they return to the hive and,if there are enough bees crawling back into the hive, the queen can climb back into the hive with the other bees. However, sometimes she cannot get back into the hive and the bees settle with her under the bottom board and they start making comb. Just an idea. But one of the fun things working in agriculture is that just when you think you have something figured out, the unexpected happens.